I have collected classic cars for 35 years. This is one of my classics from my personal collection, I have always liked the Square birds better than any of the Birds, See other cars in my collection at, www.gccc.us This 51-year old classic automobile is in remarkable condition. It has been kept in an enclosed garage along with other cars in the sellers' private collection and has never been driven in the rain or in anything less than perfect weather. It has been regularly maintained and driven only a few miles each month to keep the moving parts lubricated and in good working condition. The blue and white plush interior is in very good condition, including the headliner. The blue/white exterior is also in very good condition. This car is a true survivor with an older repaint and appears to be in wonderful condition. Just standing next to it you get the feeling you're in a time capsule which takes you back to 1960. We believe this magnificent automobile is mostly all original and has never been taken apart or restored. And while we're not sure of what the original color may have been, we're sure it has been repainted at some point because the paint is in much too good condition to still be the original. The mileage shown is 23,951, but due to the year, we assume the odometer has turned over once, however, there is no visual or mechanical indication that this car has excessive mileage on it. The interior of the 1960 model Thunderbird is very unique with a story to match. The front bucket seats and long center console (front to back) are the answer to a unique engineering problem. 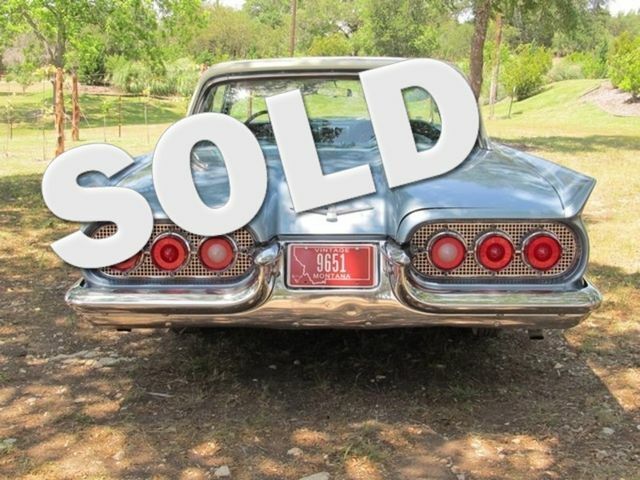 The Thunderbird sat very low, lower than most other automobiles at the time. The power train needed to be revised in order to fit under the car without dragging on the ground. The result was to burrow it higher in the car and offer a long center console. The center console was a welcomed amenity, allowing buttons, switches and ashtrays to be built into it. There's no reason you can't get in this car and drive it anywhere, but its real beauty is in its value as a classic collector's car. Anyone who watches the auctions on TV are constantly reminded as to the excellent investment buy the early Thunderbirds are now and will continue to be in the future. So bid early and bid often and this marvelous automobile could soon be yours! Disclosure: the driver's side window is cracked, however, we've chosen not to replace it because it appears to be the original glass; also, it doesn't seem to pose a danger on impair any vision. However, we can replace this window glass if buyer desires at an additional reasonable cost. There are a couple of small dime size paint blemishes on the hood scoop as shown in the pictures as well as some chips on the edge of the driver's side door and left tail fin. There is also a small half- moon cut in the door upholstery. HISTORY The interior of the 1960 model Thunderbird is very unique with a story to match. The front bucket seats and long center console (front to back) are the answer to a unique engineering problem. The Thunderbird sat very low, lower than most other automobiles at the time. The power train needed to be revised in order to fit under the car without dragging on the ground. The result was to burrow it higher in the car and offer a long center console. The center console was a welcomed amenity, allowing buttons, switches and ashtrays to be built into it.